"Snowtober" was not a welcome visitor to Roundtop Mtn. The forest now looks like a war zone. 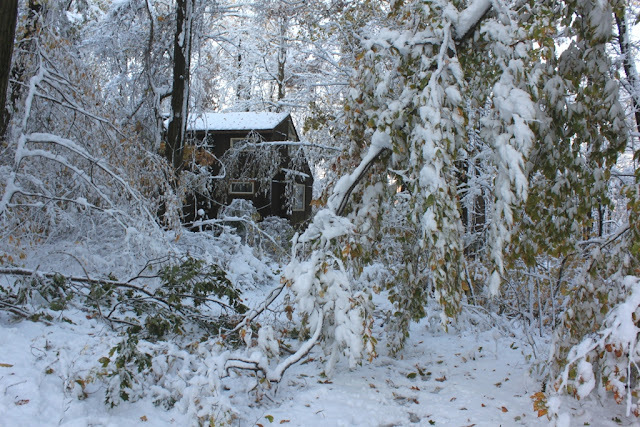 With so many trees still carrying the season’s leaves when this storm began on Saturday, the extremely wet and heavy 10 inches of snow that fell broke scores of branches and often the trees themselves. 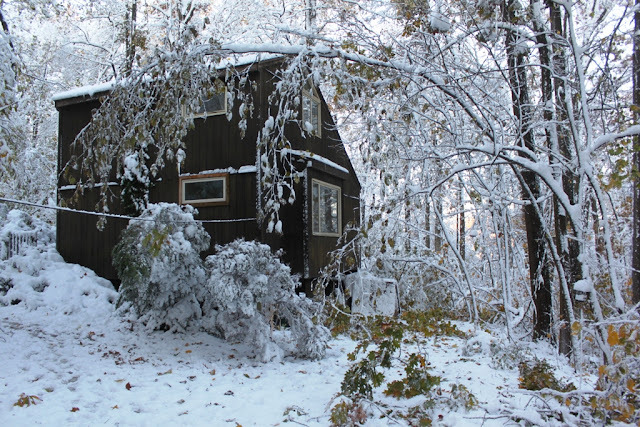 Although I am out of power and my internet/TV cable now lies on the ground, I was lucky at the cabin. I didn’t have any structural damage. I can tell you that it’s a very scary sound to hear a loud, close crack and then hear the branch or half a tree fall to the ground or the roof. I would cringe, and the cats would run under the bed. The dogs headed for their beds. The good news from this storm is that the forecasted 20 mph winds did not materialize or the damage and broken trees would be far worse, I expect. So far no one knows when power will be restored, and my internet won’t be restored until the electricity is back and running. 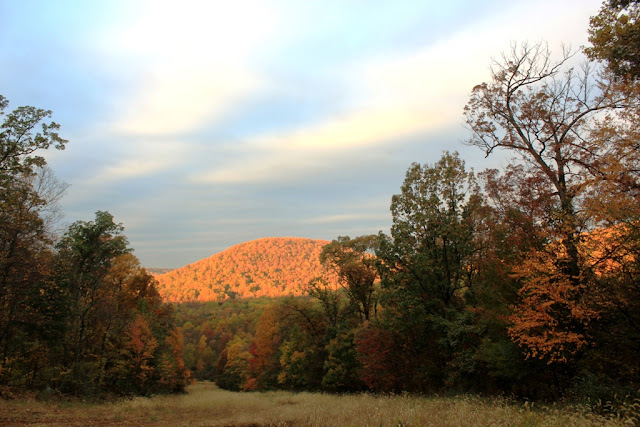 So posting here on Roundtop Ruminations will likely be spotty for a while. I cleaned up some of the downed branches yesterday, but will need a tree guy to help with the larger branches or the ones that are still attached to the trees. And getting one of those on the phone today, let alone scheduled, is proving to be a challenge. So, it could be worse. At least it’s not terribly cold. The temperature will get above freezing today and will likely reach 50 tomorrow or Wednesday. Much of the snow is already disappearing. The chickens are okay, too. Doodle even crowed this morning. Getting back to normal again is going to take a while, though. I took today’s photo earlier this week during an especially nice sunrise. Already, it looks wildly out of date to me. The forecast for tomorrow is for 5-9 inches of snow, so a scene like this one is already passé. 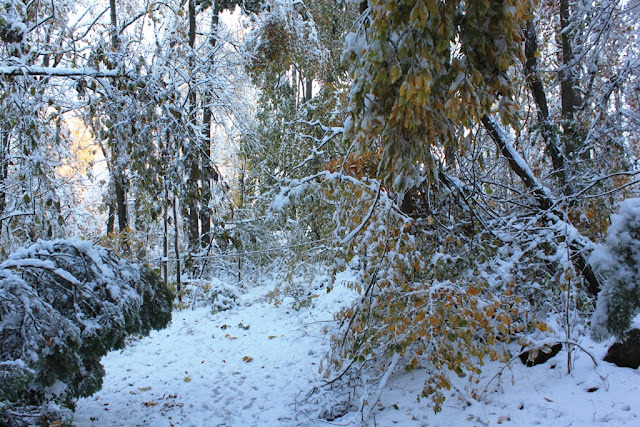 It’s not out of the norm for my area to see a late October snow. It’s just that they don’t usually arrive the day after the first frost and they aren’t usually measurable. Any snow that arrives when many leaves are still on the trees is bad. 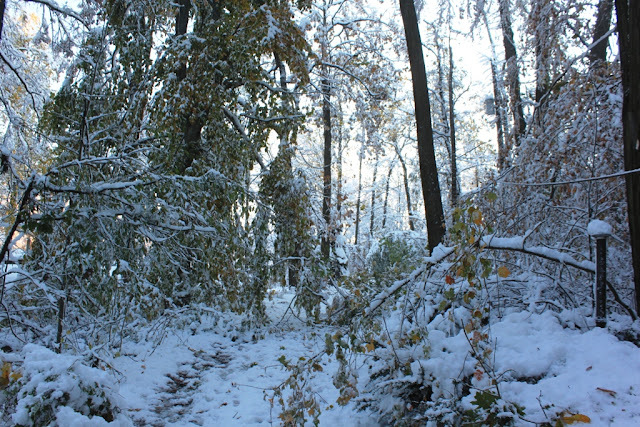 The snow will cling to the leaves and weigh down the branches they are on. The branches break and fall on power lines and roads. The trees break and fall on who-knows-what. And I am not yet prepared for winter. My chickens and their pen will need to be moved to a sheltered spot tonight, something I normally wouldn’t do for another 3-4 weeks. And even then I usually have more than 24 hours notice of an impending storm to get everything organized and everyone moved. This particular storm was pooh-poohed all week by the forecasters: an early snow, so what, no worries. It was only this morning that the forecast went from pooh-pooh to 5-9 inches. While this snow may well be a pretty snow, it won’t be a pretty weekend dealing with it. Unless the snow goes somewhere else. Or is all rain. I can only hope. But for now, enjoy the sunrise. 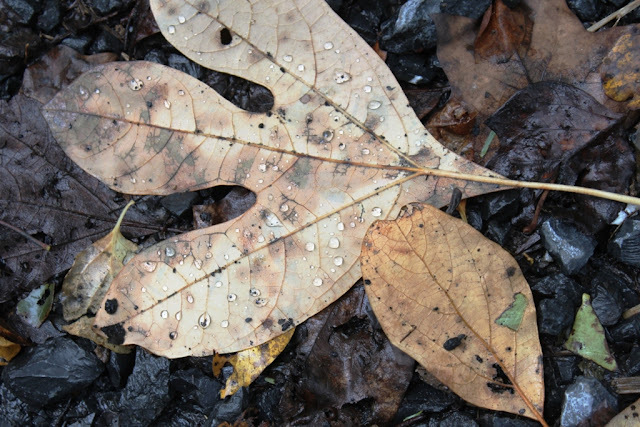 ﻿Today is rainy, and most of the fall leaves will be down before the weekend ends. 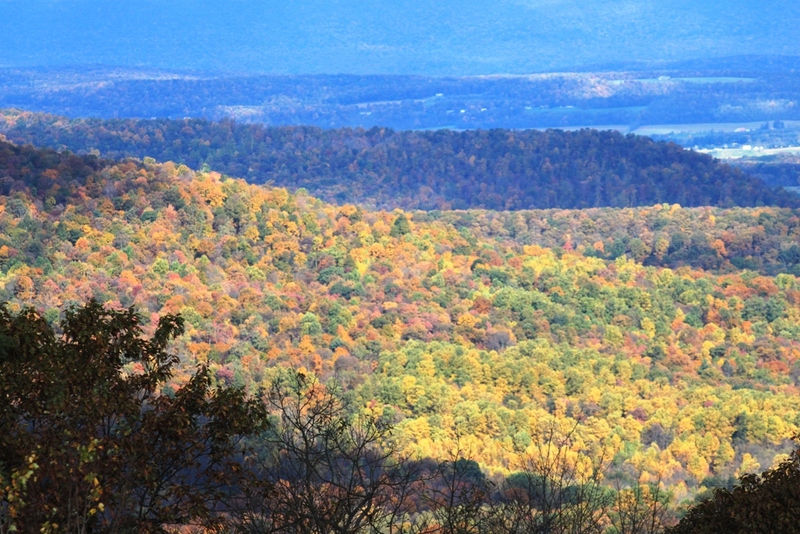 Still, I didn’t want the season to pass without posting a few of the photos I took of the peak color on Nell’s Hill. I took the photos last Saturday morning not long after sunrise. The sun still hadn’t reached the bottom of the mountain. The overcast sky added a beautifully odd light to the early morning. 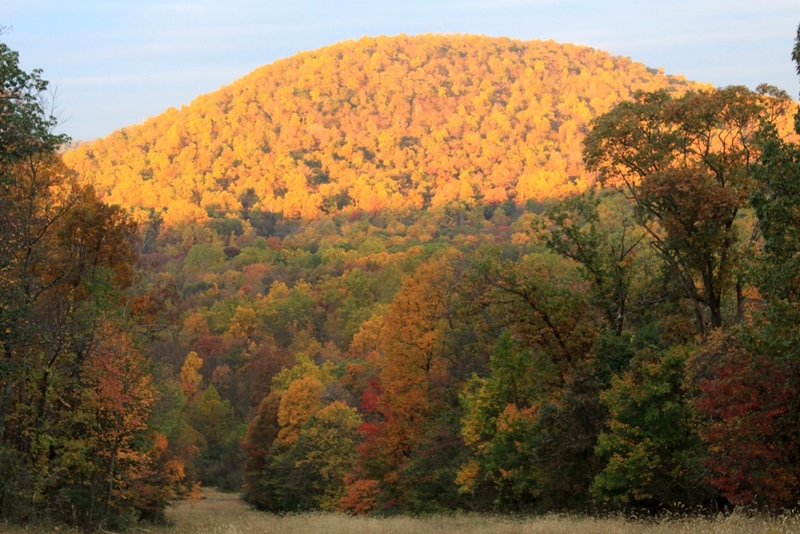 Combined with the brilliance of the fall leaves, the mountain glowed like a flame. Ah, how lucky can I get? By the next day, the color was still gorgeous, but the sky was not. It was dull and heavy with gray clouds. The mountain didn’t shine at all. The sun was hidden and didn’t light up the top of the mountain. So Saturday was the best day to see the colors, and it seems greedy to have hoped for a second day to repeat such beauty. Just so you can see the difference, I’m including the photos of the same view taken the week and two weeks before this photo. Ah, how quickly the year can change. If I’d taken photos in midsummer the same two weeks apart, you probably couldn’t see any difference among them at all. But at this point, this cusp, of the year, the difference is astonishing. And today, snow is in the forecast for this Saturday. It likely won’t be much and likely won’t stick to the ground, but looking at the photos of peak color, it’s hard to imagine that this color and snow will be separated by a mere week. Last night, the temperature was almost balmy. The early evening still held the heat of the day. I sat outside on my front deck for a while, thinking that it might be the last time I could do so for the next four or five months without being bundled up. I love the winter and feel it is already too short, but for a few minutes on one evening I could enjoy the warmth and feel a touch sad at its passing. I took so many photos on my walk down into the forest valley this weekend that I’ve decided to post them over two days instead of just one. I simply can’t choose only a few. Today’s batch will show my walk down to the pond deep in the valley—a favored spot of mine, both for its quiet and its beauty. 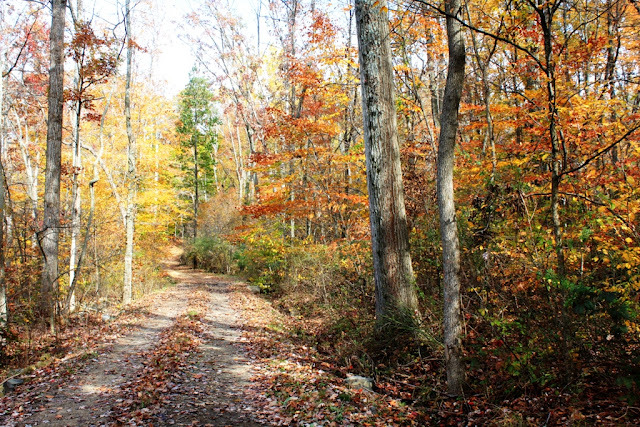 Sunday was a day of blue skies, abundant sunshine and no wind—perfect for a hike. A forest can be a noisy place when there’s even a slight breeze. 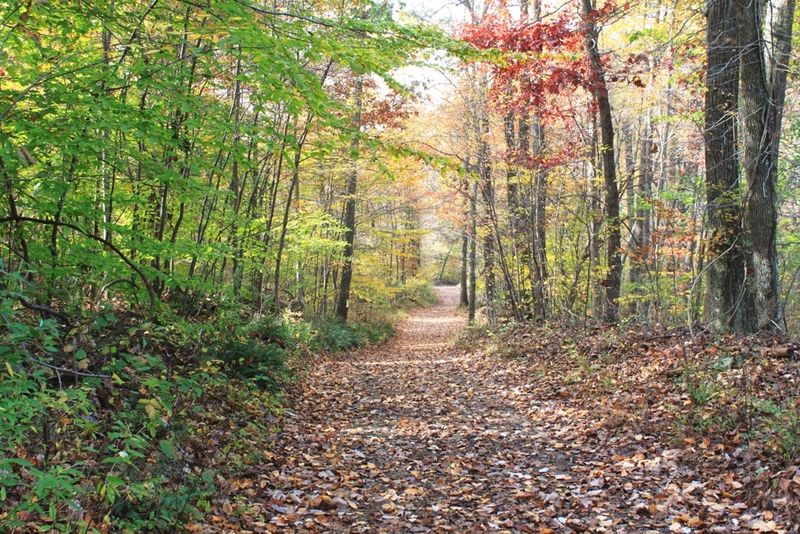 All those leaves rustling in unison can easily hide the sounds of the forest’s birds and animals. It’s a rare treat when not even a hint of a breeze dulls the sound of the rest of the forest. The only sound most of the time was that of my own footfalls. 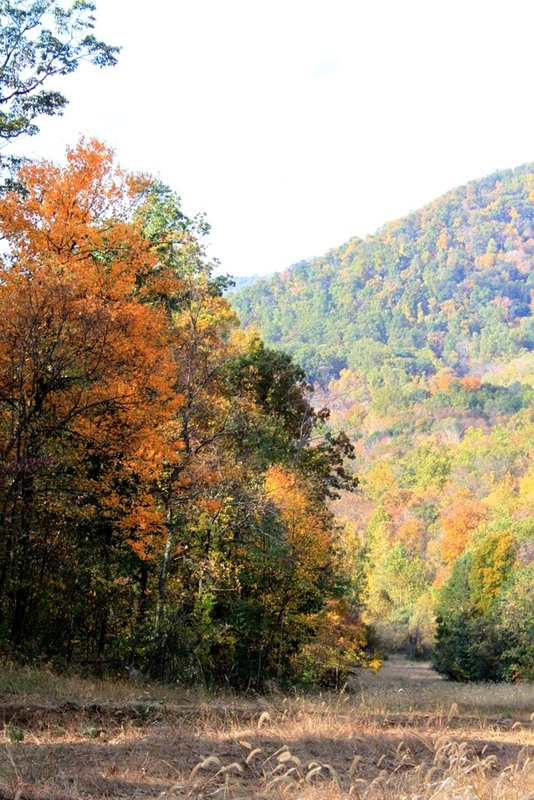 Between Roundtop Mountain and Nell’s Hill runs a narrow valley that also contains Beaver Creek. 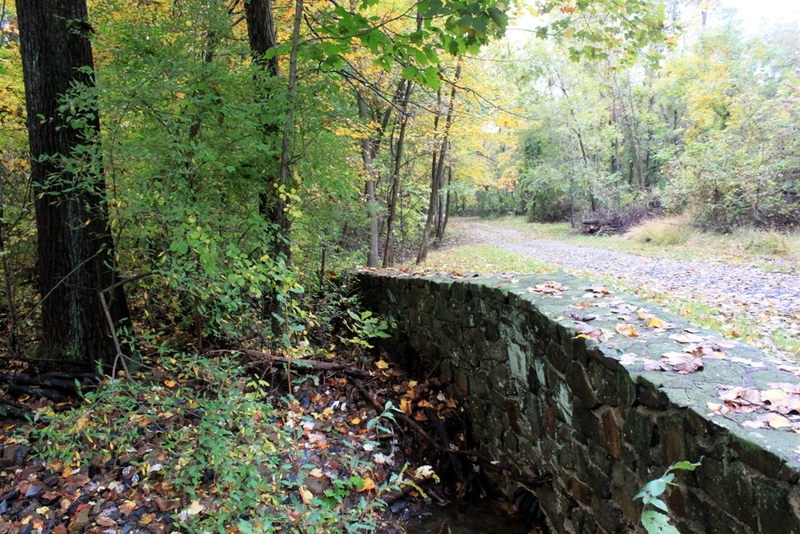 The valley is not developed in any way, except for this old woods road that once led to a long-abandoned summer camp for girls. The mountains on either side help to block sounds from outside the forest but also keep the valley in shade for much of the day. Sunrise is late coming here, and sunset is early. 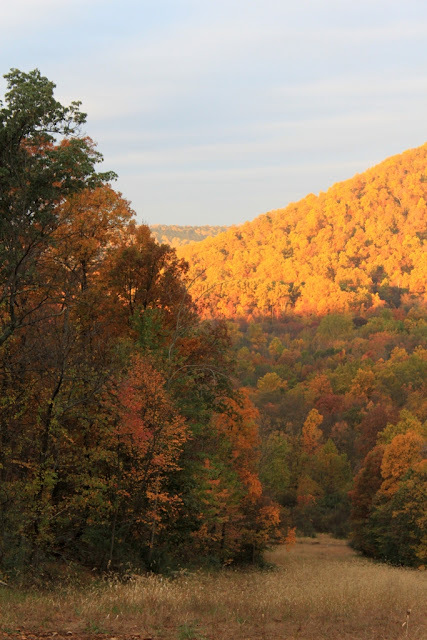 This is especially so during the short hours of winter, but even in fall the valley doesn’t get more than about 6 hours of sunlight. The valley also holds water and dampness more than up on the mountains, so ferns are lush here and the more shade-loving trees grow tall and large. Beech trees predominate over the red oak, which here is more prolific than white oak. 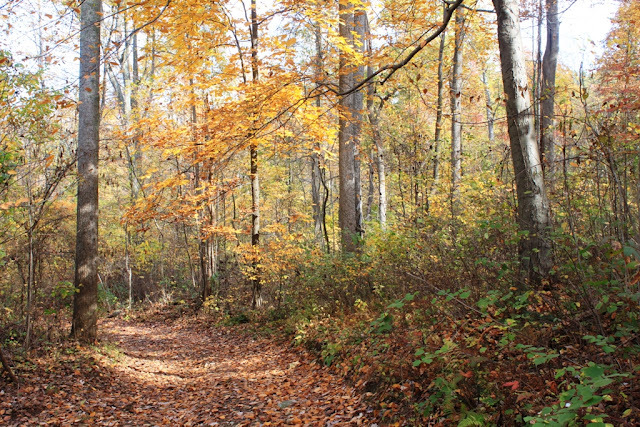 Sassafras and tulip poplar are more common than hickory. Deer are less common here than higher up, perhaps preferring the more open spaces with more grazing. Chipmunks and squirrels are the animals I see the most, and they aren’t shy about warning every soul for half a mile around that I am invading their territory. In spring and summer, the valley is a haven for forest birds. Scarlet tanagers are yearly nesters, as are wood thrush, ovenbirds, pewees and phoebes. In fall, only the year-round avian residents remain. I am frequently scolded by titmice and chickadees. 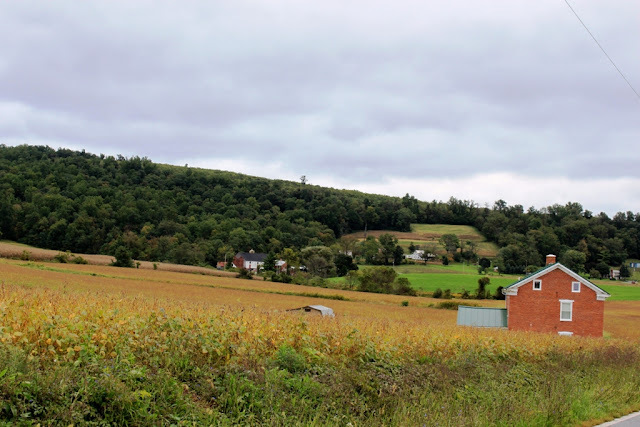 Most valleys in this part of Pennsylvania are developed in some way. Flat land is at a premium here, and is of course preferred for everything from houses to farmland. That this valley has remained undeveloped is partly due to luck, though I’m sure its narrowness is also a major factor. The valley is so narrow that building a two-lane road through it is probably impossible, and even if that were not impossible, any houses would need to be perched on the steep hillsides, not an ideal situation in any case. So the valley has remained forested and undeveloped, for which I am eternally grateful. 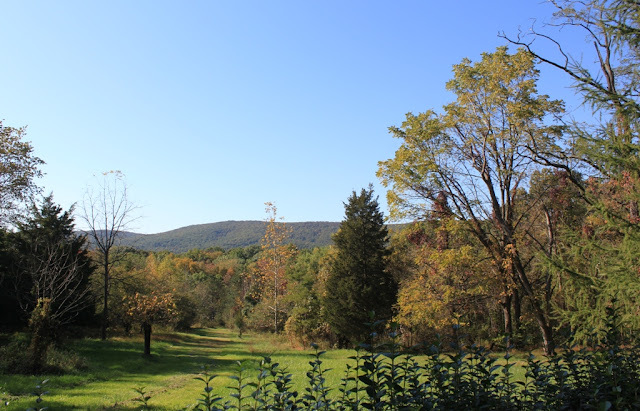 The valley and the two mountains that surround it are forested havens in the midst of the long-cleared surrounding farmland and the encroaching housing developments that threaten to gobble up our open land. The valley is also my own personal haven, where I can imagine and experience, on some level, the depth and breadth of the eastern forests before our population leveled many of them. Here, I can’t even hear the sound of cars, though the nearest public road is probably only a mile away. The forest is as quiet as it has been for millions of years, and it is here where I can feel that sense of the earth’s timelessness as I feel the closeness of its narrow valley. 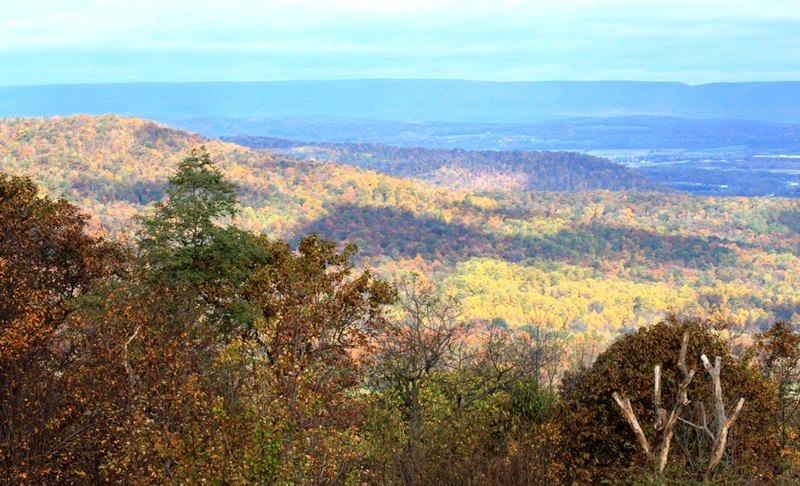 Hawkwatching at Waggoner’s Gap near Carlisle, Pennsylvania, on Friday was outstanding. The day had most of the elements for what I consider a great day: clouds and lots of low-flying raptors. Wind that didn’t blow me off the mountain or make the temperature feel brutal was also plus. And having the fall colors near their peak didn’t hurt either. Often, people who are new to hawkwatching choose a day with a beautiful blue sky to show up, and they are usually disappointed. On a day without clouds, the hawks can fly thousands of feet high, and squinting at teeny, tiny specks (or even finding a teeny, tiny speck) isn’t a lot of fun for them or for me. What is fun is having the birds fly low past wherever I’m sitting, and for that kind of day you need clouds to hold them lower. And Friday was that kind of day. Most of the time my binoculars were lowered, and I just watched the raptors fly past. ﻿The overcast sky was a bit too overcast for hawk photography, so I settled for views from the mountain on the few times the sun came out or nearly came out. The colors were very near the peak on Friday, and watching the ever-changing light skitter across the valley to the north was a treat. The hawks flew often, though, and I didn’t have tons of time to contemplate the view. A couple of time a few drops of rain fell, not enough to even wet the rocks but enough to start the edge of a rainbow for a few moments. ﻿ The main hawk flying on Friday was the little sharp-shinned hawk, a feisty accipiter that doesn’t like to share the sky with other raptors or even members of its own species for very long. They will dive-bomb each other and other raptors with impunity, and seeing the aerial acrobatics simply adds to the fun. “Sharpies” were the main attraction but not the only one. Cooper’s hawks were pretty abundant. Two peregrine falcons flew by, one very close, as did a couple of bald eagles, some red-tailed hawks and American kestrels. For the non-raptor species, I always look forward to seeing the ravens, even if some are likely local birds, and an unexpected highlight were the 7 common loons flying south in formation, flapping hard across the mountain. Saturday and Sunday were both perfectly gorgeous weather days here. I’m unofficially calling Sunday the peak of the fall color. Part of that is simply because rain is predicted for this evening and the mid-week, and that will likely bring down a lot of the leaves. 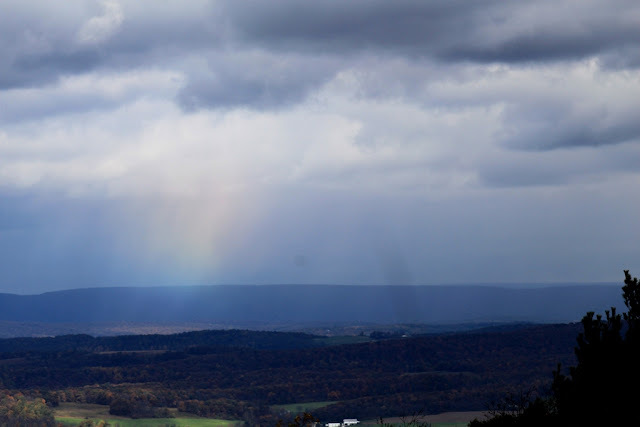 I took a lot of photos this weekend, and you’ll get to see the best of them this week in Roundtop Ruminations. One thing about all the rain that’s fallen this fall: whenever the weather does clear, the temperature change is always noticeably different than before the storm. 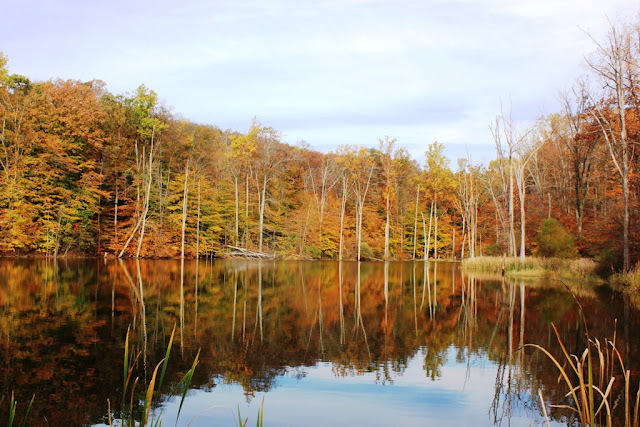 Usually in the fall the gradual downturn in the season’s temperature is not something that’s particularly noticeable. Up a degree, down two degrees, up two degrees—the change is subtle, more noticeable over a week or two than day to day. This year there’s been no gradual or variable downshifting of the temperature. When the rainstorm for this week is over, the day’s high temperature is yet another 4-5 degrees cooler than it was before the latest rainstorm. That means I have to change the clothing in my closet again. I barely got a chance to wear my after-summer-but-not-quite-fall clothing this year. At 7 a.m. the morning is still dark and has now grown too dark for morning photography, especially on a dreary morning. The time has arrived when I need to take photos in the evening. Then in no more than two weeks, it will be too dark to take photos at any time before or after work. 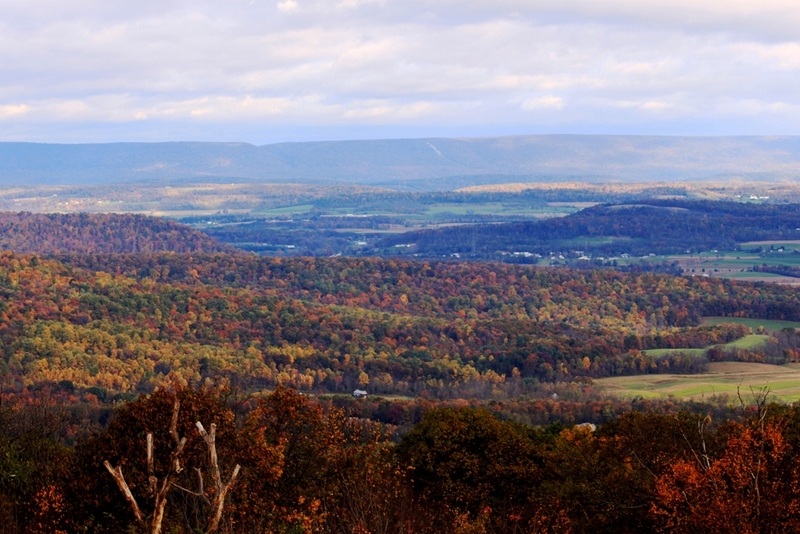 I’ll be taking (or trying to) photos for the entire week of Roundtop Ruminations over a weekend. Tomorrow I am heading out to go hawkwatching. The weather is clearing as I type and so should bring a nice batch of fall hawks. In this area the third week of October is my second most favorite time for hawkwatching (the first is the Broad-winged Hawk migration in mid-September). The reason I like this part of October for hawkwatching is that it’s the week that produces the highest species variety of the fall migration. A few of the early migrants might still be seen. The first of the late season migrants might show up, and the middle season migrants should be out in full force. On a very good day during the third week of October, it is possible to see every species of raptor migrant that is normally possible in the fall. That doesn’t happen regularly, but it’s possible. More typical would be a day when I see 11-12 of the possible 14 regular species. Specifically, I will likely see a lot of Red-tailed Hawks and I’m hoping for several Golden Eagles, as well. Theoretically, some late, lost Broad-winged Hawk might show up, and if I get really luck some late-season Northern Goshawks or a Rough-legged Hawk might fly past the mountain too. 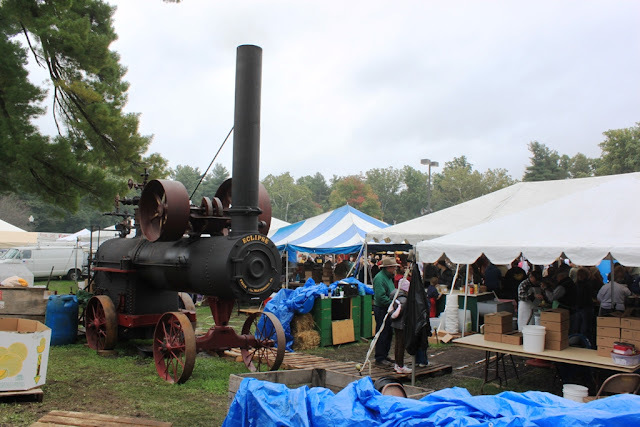 Probably it won’t come as a surprise to anyone reading this blog that a highlight of a fair dedicated to farmers and farming is the old tractor show. The Farmer’s Fair tractor show has takes up two blocks of town. 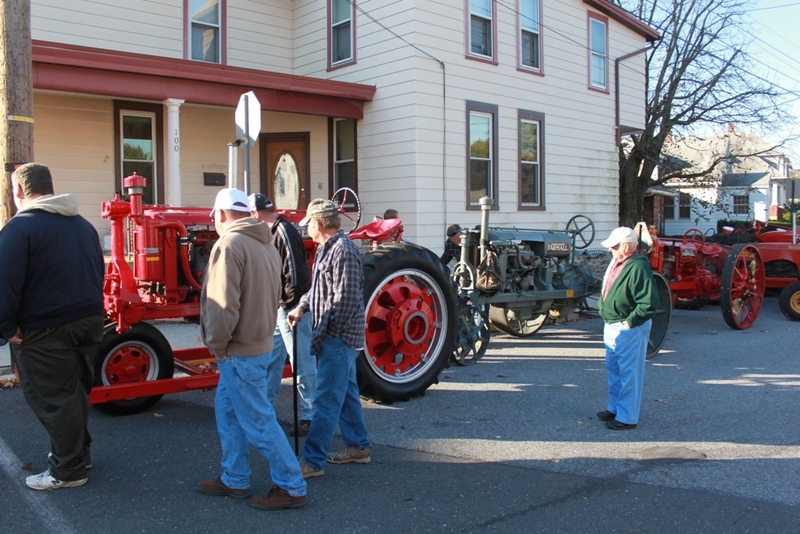 Two groups of people seem to love the tractors the most—the oldtimers who stand around talking to other oldtimers about how their farm used to have that exact same tractor, and the kids. 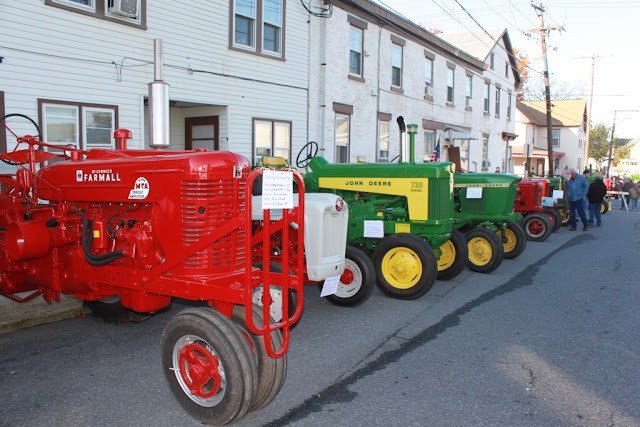 By the standards of the county fair, Dillsburg’s exhibit hall doesn’t have nearly the variety of contests, awards or entrants. 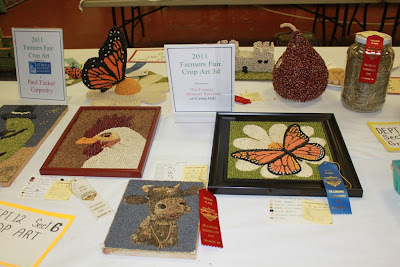 Quilts and whoopee pies win the most money and bragging rights here. Crop art is also a pretty big draw, though I’ve never understood the judging rules of what makes one piece of crop art better than another. Is it the number of different types of seeds used? Artistic merit? The ones I think should win are never the winners, so there must be something more to it that I’m not understanding. Still, I think I’d enjoy making a crop art during a cold week of winter than I would doing a jigsaw puzzle. Maybe I’ll get around to it one of these years. You, however, will not need to wait for years for Roundtop Ruminations to get back to its usual woodsy topics. That should happen tomorrow, assuming of course that the predicted rain doesn’t make the forest so dark I can’t take one. Disclaimer: For today and tomorrow Roundtop Ruminations will not be about life around my mountain cabin. Instead, it will be a bit about life off Roundtop and down amongst the town folks. Last weekend was the annual Farmer’s Fair in my hometown of Dillsburg. It was the 96th such fair, and I’ve been around well over half of them. 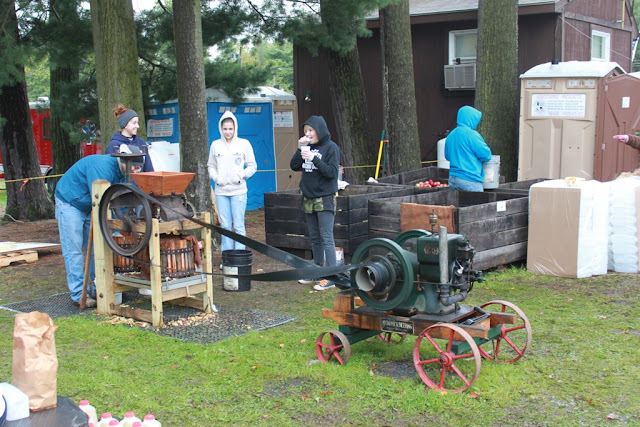 In fact, I am a Farmer’s Fair baby, which is held the third weekend of every October. The year I was born, officials were forced to stop the Saturday night parade to let my parents out of the house they were then living in with my grandparents so mom could go to the hospital to have me. I was born the next morning. I’ve been to a lot of Farmer’s Fairs. It’s a rare year when I haven’t gone. 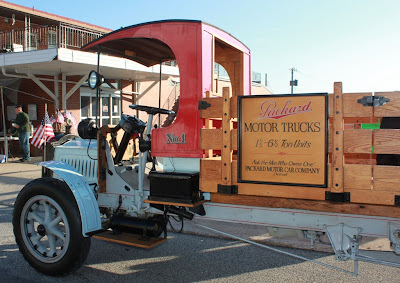 This year I wasn’t able to stay for the Saturday evening festivities, but I wouldn’t miss the farmer’s market, the exhibits in the hall, the craft fair, the food or the antique car and tractor shows. Did I mention the food? Although I’m not a fan of fried Oreos or fried dill pickles, I can eat the heck out of peanut butter fudge, homemade beef jerky, fresh-roasted cashews and the other street fair goodies that tempt me. This year the antique vehicles were especially numerous and beautiful. 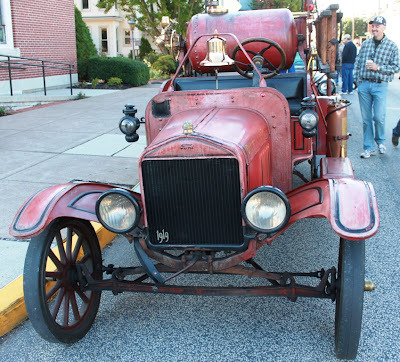 My first two photos today are of Dillsburg’s original 1919 fire truck, still with its original owners and with its original paint, which must be quite a rarity. 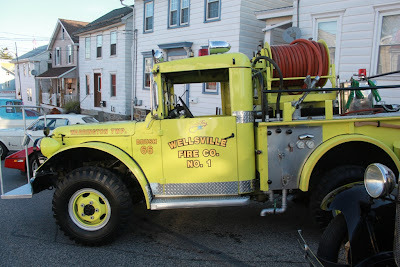 The local volunteer fire company says the truck was still used into the 1940’s, though my dad, who was in his day a regular volunteer, swears the thing was rolled out as late as the early 1960’s for really big fires. When I was a kid the old fire truck had its own special garage where the volunteers lovingly attended it. It still does. Now, it’s only rolled out for really important things like big parades. The next photos are two old trucks, both beautifully restored. 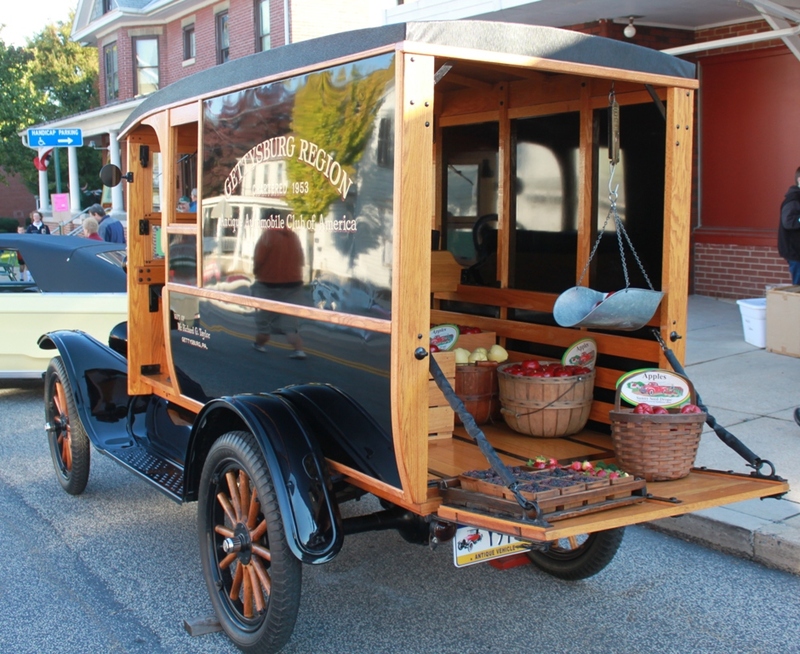 One is a general purpose farm truck (I think), and the other is a truck for delivering produce for household delivery and street sales. 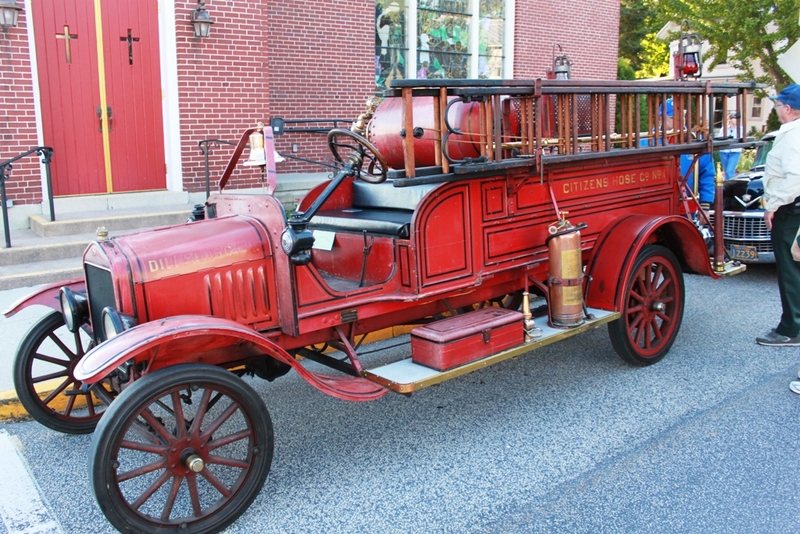 It’s an old local truck, too, from nearby Gettysburg, though, not Dillsburg. This year the weather for Farmer’s Fair was outstanding, which is something of a surprise given how wet and rainy the weather in 2011 has been. One year not long ago the festivities were actually cancelled because the rain was so severe. I can remember years when snow dusted the parade, and years when people sweltered and prayed that sundown would cool things off so they could stand to wear their parade costumes. Late October weather here is notoriously variable. This year it varied right into gorgeous sunshine. For the first time in five months, I saw a sunset from the cabin last night. 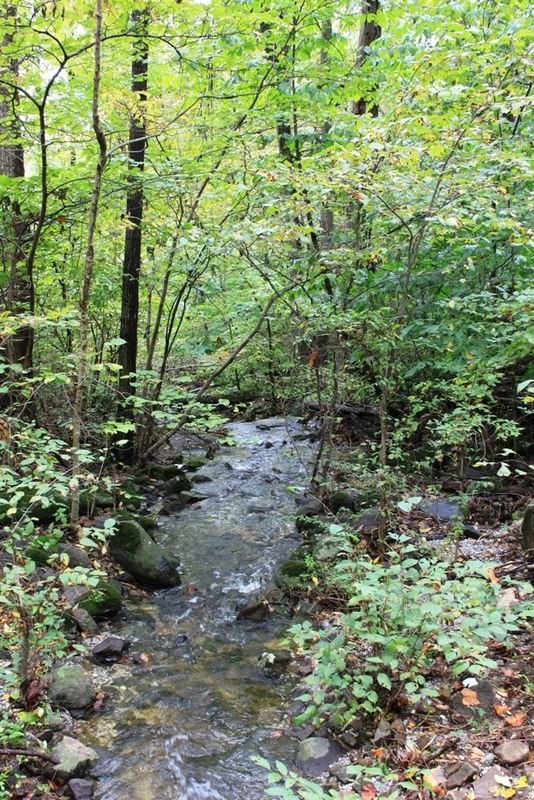 The woods around the cabin are so dense I can't see very far during the leafy season. 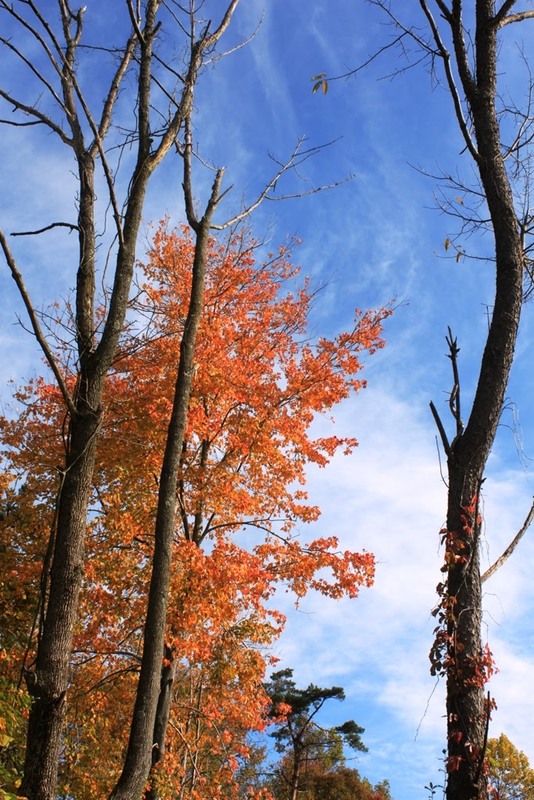 A strong breeze over the weekend dropped many of the leaves, though I'd guess that still more than half remain. 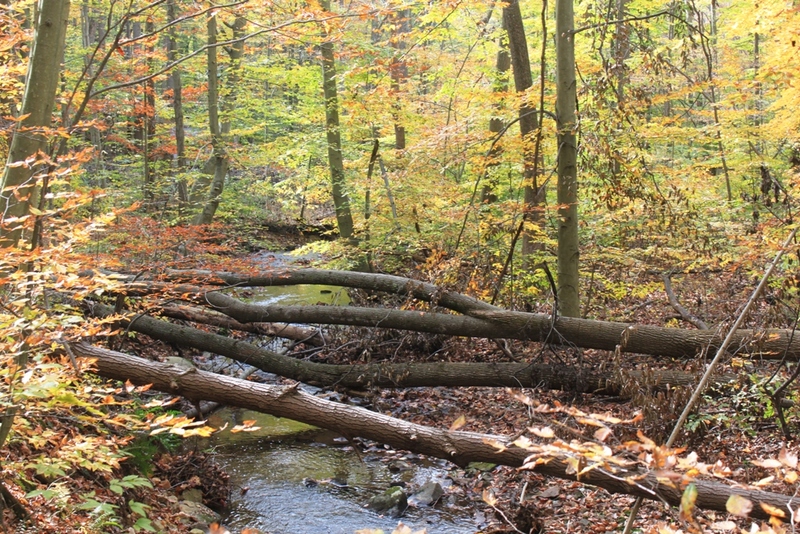 Or course, it was the colored leaves that fell, so this morning the forest looks a bit greener than these photos show. I took these photos on Saturday morning, before the wind really kicked up, though already more than a few of the leaves had dropped. Surrounded by forest, when the leaves drop, it's as though it's raining leaves, and it's loud. What would be a soft crackle when just a few trees are involved is magnified hundreds of times over, and in the strongest breezes I'd have to shoult to make myself heard to someone standing next to me. The leaf drop will probably lessen the impact of this year's peak day of color, but I'm happy enough to be able to see beyond my deck again that I can't say that I mind. There's still plenty of leaves left. Not enough have fallen yet for me to be able to see the few lights from houses that sit along the road at the base of Nell's Hill. That won't happen until the very end of the season. But I can see the top and left side of this mountain again, so my evening sunsets are back. ﻿ My second view today is another view of Nell's Hill, taken exactly one week after the view I posted last week (and re-posted here below today). 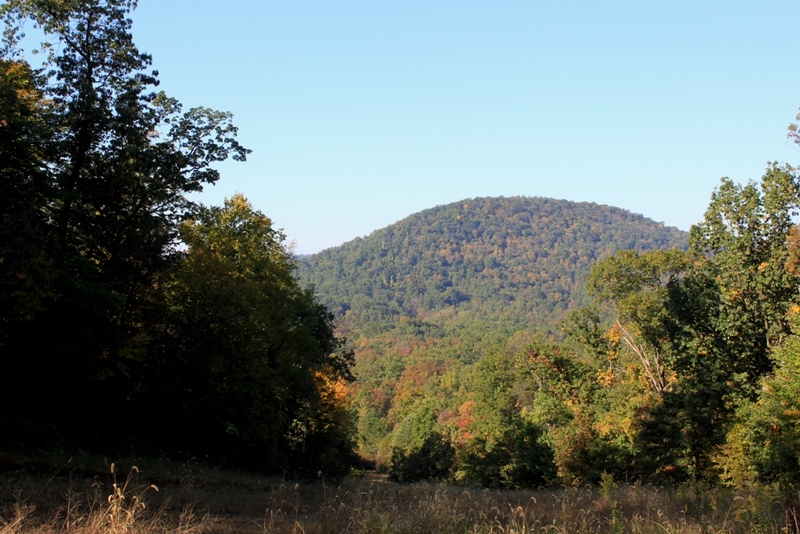 The change in the amount of color is quite noticeable, especially at the base of the little mountain where the temperature is cooler. This next weekend will likely be the peak for the color change on the mountain--assuming more leaves aren't lost in wind or the heavy rain that is (also again!) predicted for Wednesday of this week. I'll guess I'll just have to wait until this upcoming weekend to see how that goes. Gloomy weather continues today. It’s been so foggy this week that I have no idea how the color change on Nell’s Hill to the west is doing. As the weather will clear overnight, my first glimpse of it will be tomorrow morning. Whether or not the color change has progressed much in the week since I've seen the mountain, the view will be a surprise. 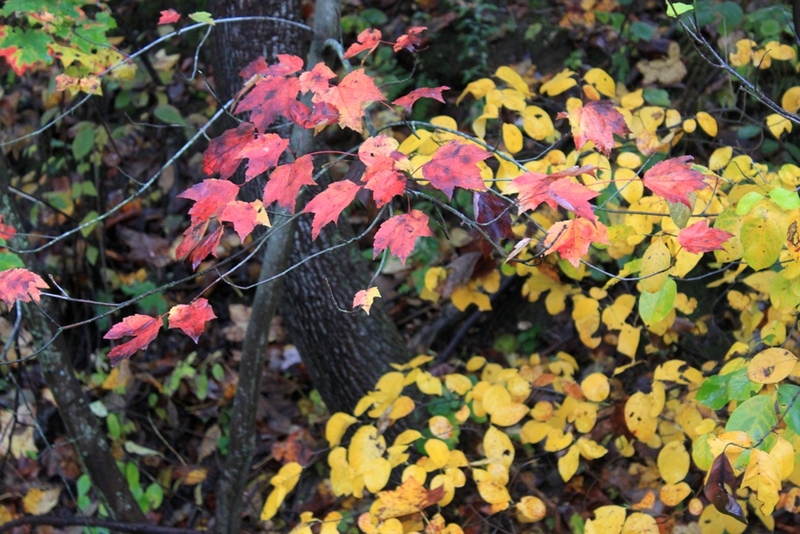 Elsewhere around the mountain, the color continues to be variable. In some places the colors are well along, though muted by the ever-present fog. Then just a few feet further along the trees may all still be green, and just a few feet further on, the leaves may all be on the ground. Thunderstorms rumbled around all last evening, close enough to rattle Dog, who has been scared of them since he was caught outside in a doozy of one 4-5 years ago. The poor weather has kept us all inside this week—downpours and thunderstorms don’t make for many forays into the woods. I, for one, am feeling the lack, especially the lack of seeing birds, who are no doubt hunkered down somewhere as safe and dry just as I am. Mid-October is normally a very good time for birding, so it’s especially frustrating not to be out there looking for the variety this time of year usually harbors. 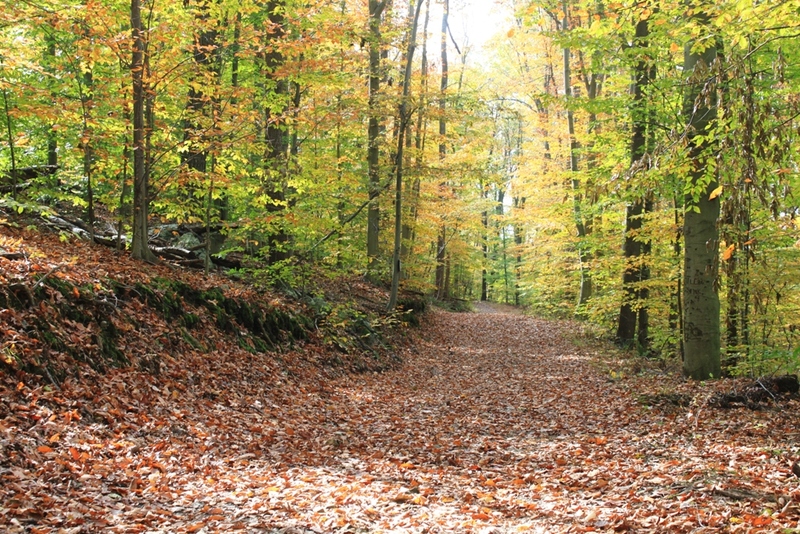 Leaves are already starting to fall, littering the woods and my driveway. Last night’s rain proved heavy enough to knock down many of the leaves that had already dried and turned color, though the driveway is not yet completely covered. By the time the last of them fall, the leaves will be at least ankle deep. As yet, spots of driveway and forest floor are still visible, so what I see today is only the beginning of that yearly ritual. It is normal for some leaves to fall before others, though I always find this a bit disconcerting. For some reason I’m afraid that means there won’t be much to the blaze of fall colors, that little will be left to see. I probably know this isn’t true, but the fear is there anyway. I keep expecting that all the leaves will be at their peak on the same day and that none of them will fall before that day. This never happens; it’s only in some perfect vision of fall that would be the case. Today’s photo was taken last evening in the valley off the mountain. 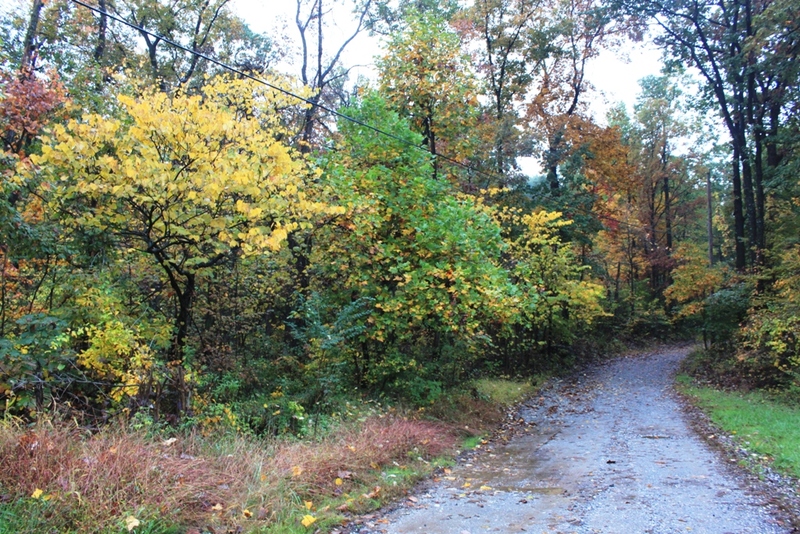 I tried to get one of the road up to my cabin this morning—the colors have really come along in the past few days—but the dense fog and rain so washed out the shades that I will wait for better light. I just hope the leaves don’t fall before I can get that photo! I am wearing sandals today, probably for the last time this year. This is a kind of personal tradition of mine. I wear sandals one last time on the last warm day of the year. This year I miscalculated. I should have worn them yesterday. The weather forecast for today was warm enough a day ahead of rain that is to be followed by cooler weather that it should have worked. Instead, the weather is overcast and already damp. I think I’ve heard coyotes howling twice in the past 24 hours, once yesterday in the early morning and again last evening. If so, this would be a first for Roundtop. I’ve heard coyotes before, out west and in Pennsylvania’s mountains further to the east, but never at Roundtop. The howling was quite distant but didn’t sound dog-like to me. I know the barks of all the surrounding dogs, too, and this didn’t sound like any of them. Several canines were howling together, and unless someone over on the next mountain came home with several new dogs recently, no one has enough to sound like a howling pack. Perhaps 5 years ago I saw a single coyote several times during the summer at Roundtop. I never heard that one howl, no doubt because it was a singleton without a pack. He had no one to howl with or to. Yesterday on my travels I noticed how variable the color change is right now around the mountain. Some views look nearly at the peak of color, others spots just a few feet away have barely started. I continue to see lots of white-tailed deer on the move at all hours of the day and night. Yesterday I saw 10 in about four different spots. Oddly, I’ve yet to see any buck in this last week. I suspect they are still in bachelor groups and if I could find a group of those, I’d see half a dozen buck at once. Instead, I’m seeing doe with spring fawns, now spot-less as their grow their winter coats. I’ve always liked seeing how things change over time. Partly, I think that’s because how I remember something is not as precise as I’d like it to be. Certainly, my memory is no where near as precise as a photo. How long has that tree had a broken branch? Did it just happen or am I only noticing it now? Was that coltsfoot flower there last week, or did I just miss it? And so on. 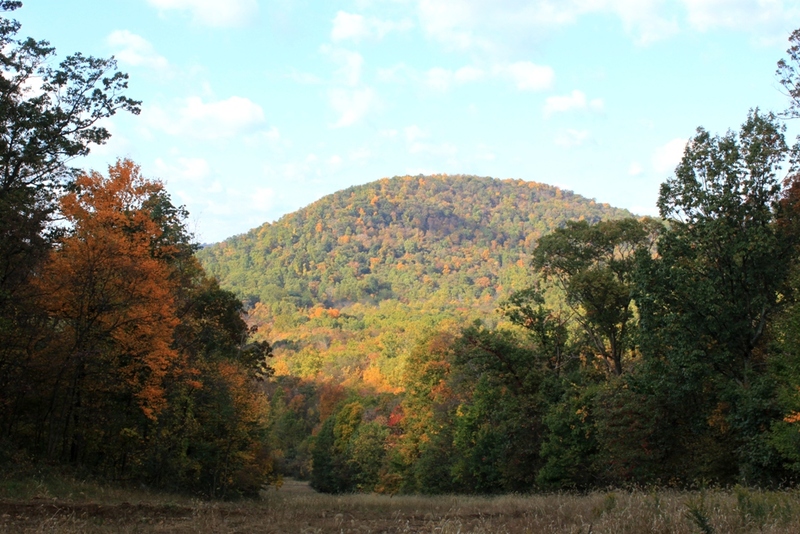 So today I am posting a photo that I took on Sunday morning of Nell’s Hill, the little mountain to the west of my cabin. 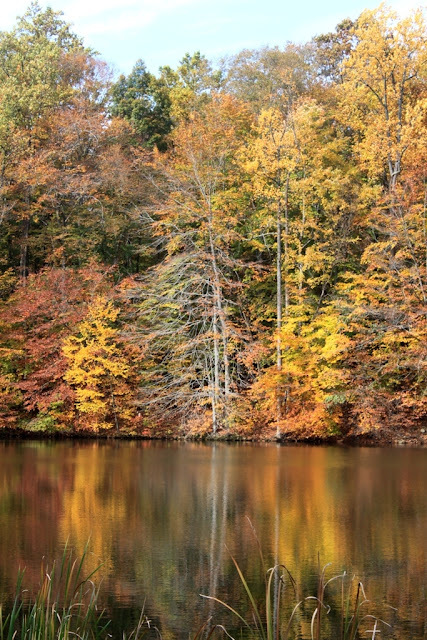 Over the next 2-3 weeks the trees will change color and by 4-5 weeks from today the trees will be bare. I’ve decided to post a photo of this view several times over the next weeks so I can compare this view with those taken later in the fall. Partly, I just want to get a sense of how quickly (or not) the season progresses as well as how much leaf change occurs in the span of several days. Weather permitting, which it won’t this week, I’d like to take the same photo every 3-4 days. This week that would mean I’d take a new photo on Wednesday or Thursday, but it’s supposed to rain on both those days, so realistically my next photo will likely be taken on Friday or Saturday. At this point in the season, that’s probably okay since this week isn’t hitting at a critical point in the color change. As you can see, the weather was gorgeous on Sunday morning, with not a cloud in the sky, though a bit of early-morning haze was evident. A few trees are changing color, though not so many just yet. There’s a pretty yellow or orange tree down on the left side of the old ski slope. A few reddish shades are visible. Over on the mountain, it’s not much different. An area in the middle of the hill has several trees, likely of the same species, that have some color. And here and there amidst the green are individual trees showing some yellow or orange. Basically, not much is going on with the color change just yet. But as with all things, that will soon change. How long had it been since I’d seen the stars? I can’t remember exactly. I know I didn’t see them the entire month of September, but it could have been longer than that. 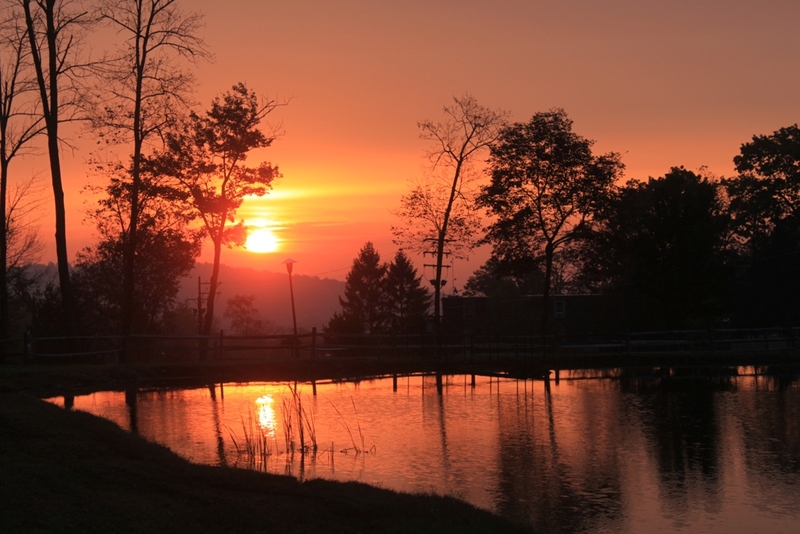 August’s hazy skies often obscure all but the brighter stars, even on cloudless nights. Six weeks without a clear night to view the stars is my best guess. So that amount of time without a clear view of a sight I’d previously taken for granted no doubt accounts for my gasp when I saw the perfectly clear night sky spread out in front of me during an early morning walk with Dog. Certainly, in the time since I’d last seen the stars, they had circled around and now presented me with a different view. Now, Ursa Major stands on his tail. Canis Major loyally treads behind Orion, who still stabs at Taurus the Bull. The Seven Sisters peer down, shyly some would say, from above. It is a gorgeous sight, made more so by the absence. The reappearance of a starry night sky is not the only “new” thing I’ve been seeing either. Suddenly, deer are everywhere. No doubt the fall rut is beginning. Yesterday morning I saw 10 of them, including two small but newly spot-less fawns, still running with mom. The deer are all over the place, even in daylight. It’s that time of year when I have to drive cautiously at night, as they jump out in front of a car without a thought for the potential danger. Only their eye-shine by the side of the road warns me. Some summer avian residents remain, though many are gone. Up through the weekend, I still saw chimney swifts, though the swallows and kingbirds, pewees and wood thrush are long gone. Catbirds are still here, and robins. The last are in flocks, now, so I believe they aren’t the local residents, but those that summered further north, now grouped together as they move south again. I’ve seen several large flocks, more than 100 each, of Canada Geese. These are likely migrants. The local residents typically don’t fly either as high or in as large a group. A peek at the local radar shows large numbers of birds moving through the region overnight. Sometimes I hear their chip notes, or their honks. In years past, on a moon-filled night, sometimes I even catch a glimpse of them. Make no mistake, all migration lanes to the south are now open. Birds are pouring out of the northern woods and taking to the skies, heading to warmer climes. I will remain here and hope to welcome them back this spring and for many more to come. 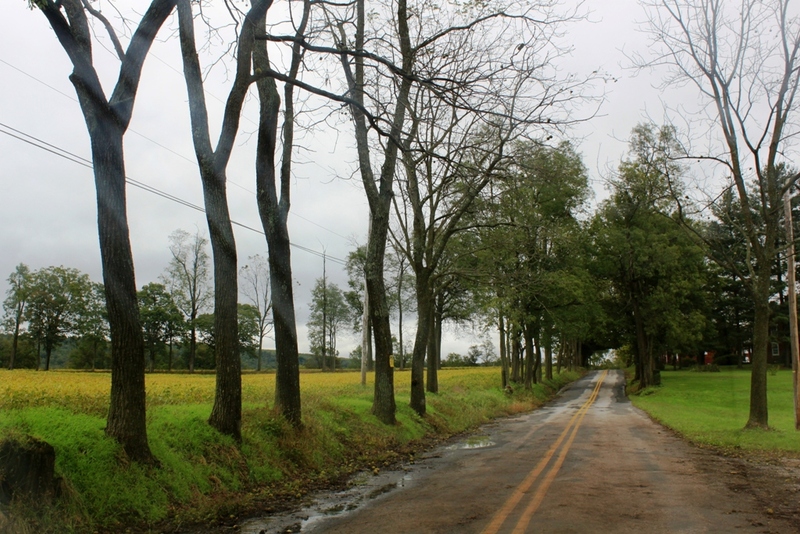 Pennsylvania has a lot of different species of trees. I’ve heard numbers ranging from 108-134 different species, plus another 40 or so introduced species. That is one reason why the autumn leaf colors last so long here. More northern areas tend to have fewer species, and while their color change is very dramatic, the time to see that color is usually very short. 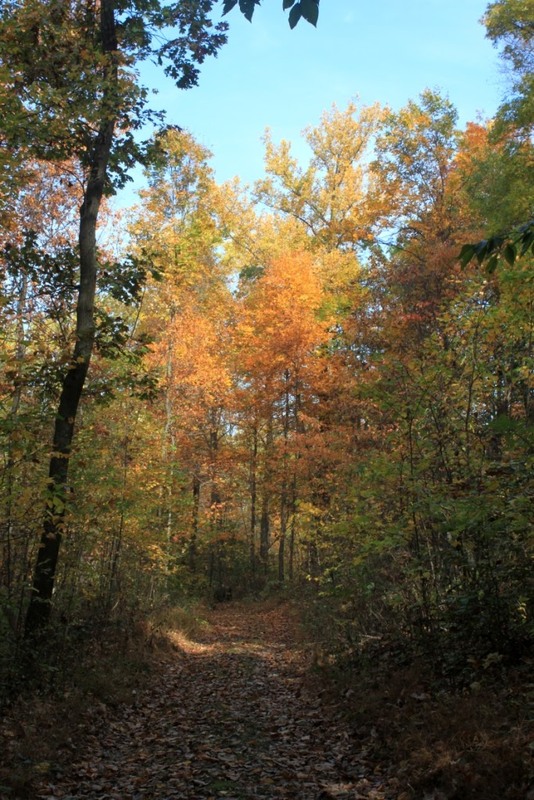 Each tree species has its own time for the color change; some change early, others late. For me, that’s both good news and bad news. The good news is that I get to see the gorgeous for colors for a long time. I will have color on the trees from now through early November. The bad news is that the forest here is rarely, if ever, all gorgeous at the same time. 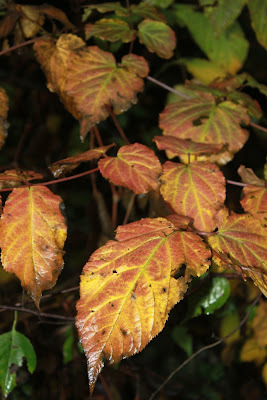 Often, there’s color mixed in with greenery, except at the end of the season when color is mixed in with bare branches. The first wave of color change is going on now. Normally, the first wave is a yellow shade, except for aptly named red maple, which joins in too. Hickory and sassafras are in this first group. Next is the orange wave. In this area that means the white oaks, and since there’s a lot of those here on Roundtop, that is a particularly pretty time of the fall. That probably won’t happen here for another two weeks or so. When I’m lucky, the orange second wave and the final wave of red can come pretty close together. The last of the maples and the red oak are in this last group. This group changes the last week of October and into the early days of November. Since nothing in nature is ever an absolute, these are general principles only. 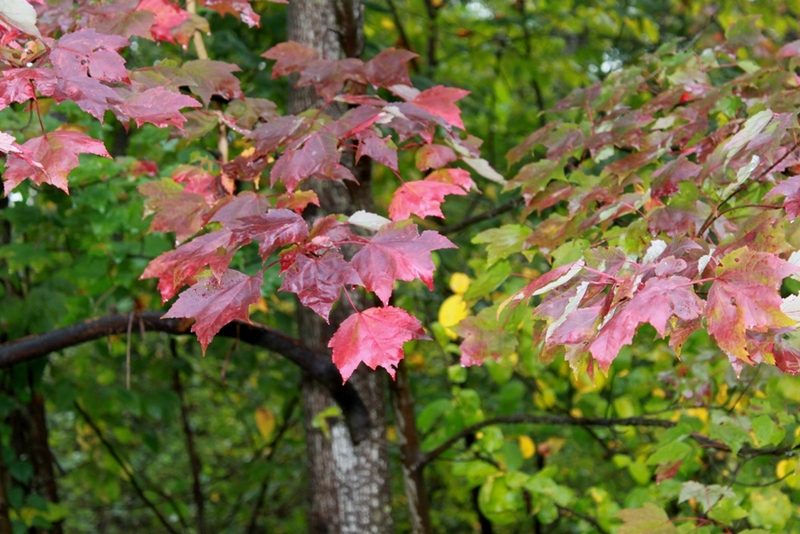 Certain species, like sugar maples, can show different colors on the same tree at the same time. Other species can show different colors from year to year, depending on soil and weather. 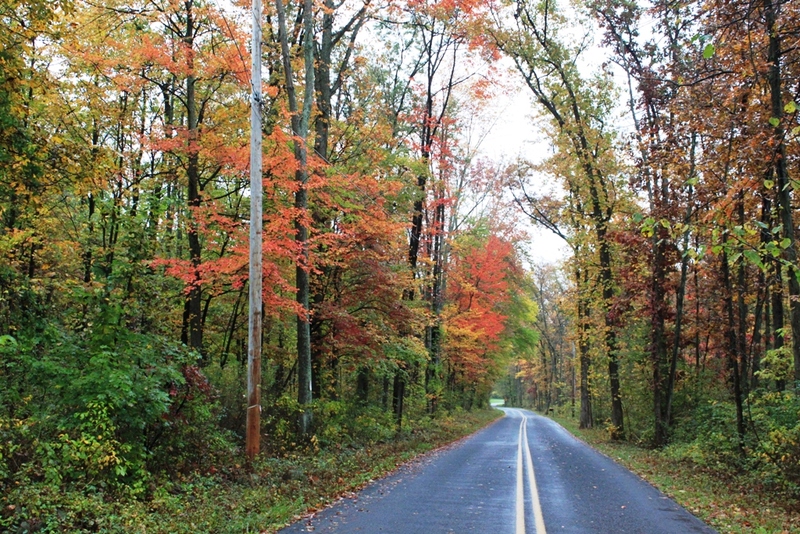 This year I’m hopeful the floods of September will yield an extra bounty of brilliant colors during October. I plan to take as many photos as possible. This time the forecasters are promising that the month-long spate of rain, gloom and more rain is coming to an end. Sun, they say, that mysterious and unseen yellow orb, is about to return to central Pennsylvania. I can only hope they are right for once. In the meantime, I am having another gray, showery day, though at least it is without fog. I’ve learned over the past month to find pleasure in small improvements in the lousy weather. I’ve agreed to find intermittent showers with a high cloud ceiling a major improvement over hard rain and the claustrophobic fog. But tomorrow sun is promised, and I’ve already gotten my sunglasses ready. Perhaps I’ll even need snow goggles as I doubt my eyes will be able to cope with bright sunlight. I’m looking forward to photos with blue sky in the background. Perhaps I’m being too hasty. I’d better not count my chickens before they are hatched, as the old saying goes. Let’s just say that I am cautiously hopeful and leave it at that. In the meantime, I’ll leave you with a few more gloomy photos. On a cold and blustery Sunday morning I went to the nearby Apple Harvest Festival, where I annually spend too much money and eat too much. This year was no exception. Let’s start with the weather. Before the rain, fog and gloom of September, it was summer here. The fog has disappeared, if not the rain and gloom. Now somehow, between the clouds, the temperatures and the wind, I find suddenly find myself in November. At least that’s how it feels. The festival runs for two weekends. Next week is the second weekend. Crowds were light this weekend, at least on Sunday morning, which suited me and my dislike of trying to look over people, bumping into people, etc. I’m sure the organizers and the vendors weren’t thrilled. Likely, people are hoping for better weather this upcoming week. Vendors who were selling sweatshirts, hats and even gloves were doing a good business. 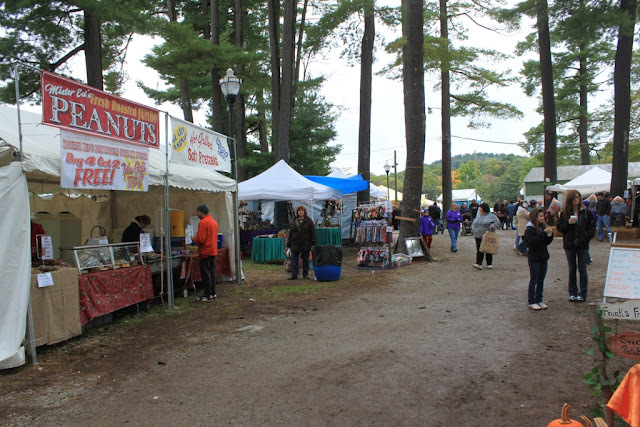 The festival is a great place to pick up a few gifts for Christmas, as the craft vendors are outstanding. I came home with a handmade basket, a couple of kugels (handblown glass balls sometimes called “witch balls”), a braided rug and a nice print of a pair of Carolina wrens and one of an old local barn. After I couldn’t carry anything more, I decided it was time to start eating. This requires a trip around the entire fair as I can only eat so much, and I don’t want to eat one thing only to find something even better a few stands away that I simply can’t find room in my stomach for. This year I settled on a huge pulled pork barbecue and some apple crisp. I also came home with a loaf of homemade apple crumb bread. I could have spent more money and would have liked to try the apple sausages or the pit beef and the interesting kinds of soda made by a local brewer. Perhaps I’ll just have to go back again this weekend.